We've seen plenty of photo series that focus on breastfeeding women—but this one is like any other. The women are all in uniform. And the photographer's recruiting. Photographer Tara Ruby is committed to capturing images of truly strong women doing something that's pretty amazing: breastfeeding. We've seen plenty of photos that highlight the beauty of this aspect of motherhood, but none that look quite like this one. The woman in it are in uniform and they're nursing—and it's an amazing testament to what women are capable of doing. Ruby has previously captured a photo of ten uniformed soldiers. 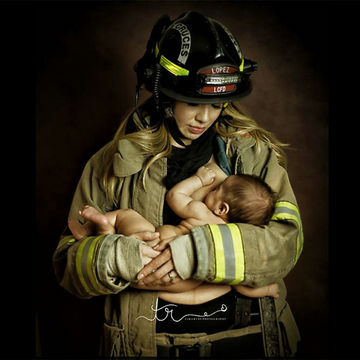 She said the photo received an overwhelmingly positive response and it got her thinking about the balance required of working moms. Ruby decided to move forward and capture more images in this vein. "The first thing that came to my mind was a firefighter," Ruby told the Huffington Post. "And the response is just extremely positive." The photo below is reportedly a shot of a firefighter's wife. Ruby put out a call for nursing moms who wear uniforms—any uniform—to work every day. She's willing to shoot sessions for free and is particularly looking for women outside the career of firefighter, doctor, nurse or cop—she's already photographed a doctor and is currently working on shooting a police officer and women from other fields. One mother praised the photo in the comments section: ""I showed this to my [5-year-old] daughter. To show her that she can be a mommy AND a [firefighter] (that's what she wants to be when she grows up). So I asked her what does she see. She says 'a mommy taking care of her baby!' So plain and simple! Nothing sexual. Just taking care of a baby," she wrote.